Yesterday I decided to make sauerkraut from the huge cabbage that was in my CSA box a week ago. The recipes online are incredibly easy. 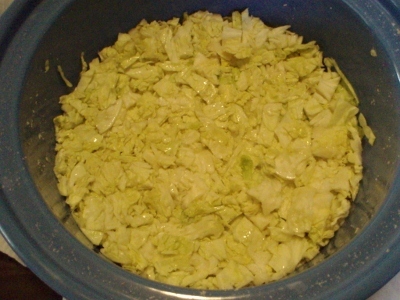 Cut or shred the cabbage, put in a crock, and toss in some salt. Put a plate on top of the cabbage. Fill water in a quart jar and place on top of the plate. Ferment for 1-4 weeks. What do I expect? A very smelly house. Just cutting the cabbage sends out that cabbage smell. Will it be edible? Only time will tell. So far, the cabbage that filled the crock to the rim has shrunk down to half its former height. I am eager to see what happens in the coming weeks.